The Invivo Family of MRI Patient Vital Signs Monitoring Systems have been developed from the ground up specifically for use within the harsh and unforgiving MRI environment. Every component of the system is designed to withstand this harsh environment and its high Gauss rating and 1.5 and 3.0T compatibility regardless of parameter configuration is a reflection of this fact. All systems use a smart battery management system to display the battery life for each device, which eliminates problems while increasing patient safety. All devices feature user replaceable batteries, which allow for continuous battery operation. The Wireless ECG and SPO2 units feature shorter cables designed to increase throughput. Shorter cables also reduce the risk of cable heating and are less prone to damage. Each system delivers a new standard of MRI patient care and also has advanced Digital Signal Processing to eliminate gradient and high field artefacts. This software-based system allows the unit to evolve as new sequences and MRI systems are developed. 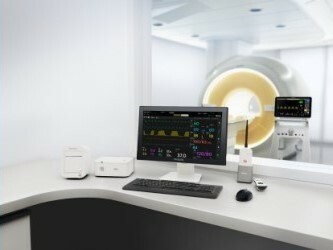 MRI Patient Vital Signs Monitoring systems currently available are the Invivo Essential, Expression IP5, Expression MR200 and the Expression MR400 giving you an unparalleled choice of patient monitoring to meet your needs.